Since PolyMet is talking about its ability to make money, and the state is fixing to seriously consider whether to let PolyMet try, and what kind of financial security needs to be demanded as a condition, I thought the story was worth a reprise. Update to the reprise: On August 5th, ten environmental groups, led by the Minnesota Environmental Partnership, sent a letter to Governor Mark Dayton asking for his leadership to ensure that a Mount Polley doesn’t happen in Minnesota. In particular, the groups criticized the fact that PolyMet continues to rely on water covered storage of mine waste on LTV’s old, leaky and unstable tailings impoundment. The letter goes on to describe some recent examples of the leaking of and failure of mine waste impoundments in the state. Oh, how bad could that be? you say. It sounds as though it will wipe out a 1,500,000 fish sockeye run. But what’s that in walleyes? you ask. I don’t know the exact conversion rate, but it’s probably a lot. Here’s a photo that you can imagine near Hoyt Lakes or Ely. 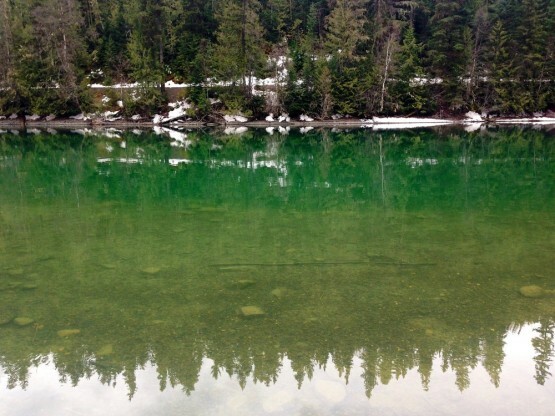 This is close to the town of Likely, British Columbia. Likely to be deserted soon, that is. Frankly, it would be easy to burn a few hundred words gagging over this monstrosity. But we have bigger toxic fish to fry. You see, one of the questions that is often asked after something like this happens is: Jeebus, who’s gonna pay for this? The answer, my taxpaying friends, is that nature turns its lonely eyes to you. Lastly, there is the question of whether Imperial Metals will have enough money to cover for the damage caused by the tailings pond breach. Although the mine was partially financed by Sumitomo, a large Japanese company, [Sumitomo looks to be the “big” mining company, just as Glencore is the “big” mining company to “junior” PolyMet] it remains uncertain if Sumitomo would be on the hook for any damage. [It does not remain uncertain at all; Sumitomo will tell the citizens of BC to take an effing hike.] 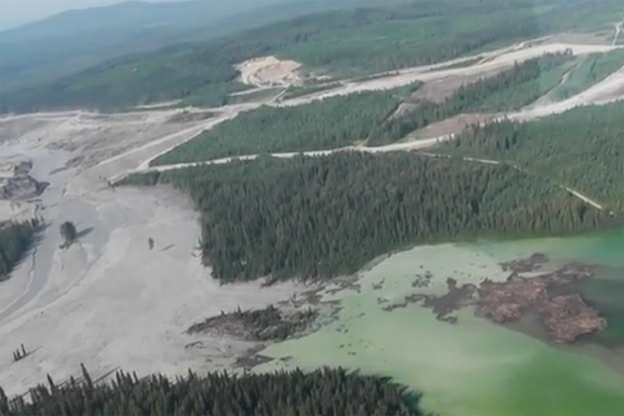 Imperial Metals’ stock nosedived 40 per cent following the tailings pond collapse, which compromises the company’s capacity to cover the financial damage of the disaster. A critical problem pointed out in the 2001 report was that the liabilities of BC mines far outweighed the total amount available in reclamation bonds. The report put BC mine reclamation liabilities at $400 million, but the total available in reclamation bonds was less than half that amount, at just $172 million. Another question is what would happen if Imperial Metals went bankrupt [not really if, but when], as the Montreal, Maine and Atlantic did after the crude train explosion at Lac Megantic, leaving taxpayers on the hook. A response from the BC government regarding reclamation bonds is pending. One can hardly wait for the BC government response, eh? “Reclamation bonds” is Canadian for financial assurances, a matter mostly ignored by the regulators, particularly the Land and Minerals Division of the DNR in Minnesota, so far, in L’Affaire Polymet. Just insert the Land and Minerals Division of the DNR for the BC government above. I hope that you are beginning to see the problem. The Land and Minerals Division is the bunch that said, in a hearing before a committee of the Minnesota House of Representatives earlier this year, that it couldn’t possibly ask the principal shareholder of PolyMet Mining, the international mining consortium Glencore, to backstop PolyMet for its environmental liabilities. Sumitomo, Glencore: let’s call the whole thing off. When you hire dingoes as babysitters, chances are the baby will be eaten. That’s John Oliver’s wonderful image for giving the wrong people a public charge. Mount Polley was at one point at risk of closing during the late 1990s, due to low commodity prices. But the BC government stepped in via the Job Protection Commission in 1998, which helped keep Mount Polley and several other mines open by conducting studies and designing “an economic plan to allow the mine to continue operating.” The move was said to have saved over 200 jobs at the time. NDP MLA Mike Farnworth, who was employment and investment minister at the time, said he believes [but his recollection is hazy!] 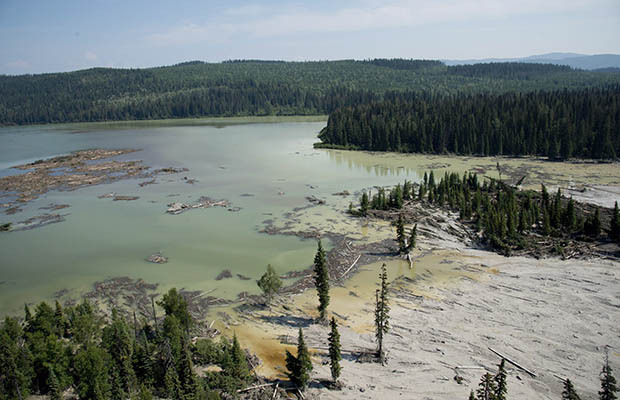 no environmental regulations were relaxed in order to keep Mount Polley open, however. “I believe the changes were more on the financial side,” he said. The government had proposed to make some changes to regulations and tax policies to help some mines stay in business during a time of plunging copper prices and a recession in Asia. Replace Mike Farnsworth with names like David Dill, Tom Rukavina, Tony Sertich, and Rick Nolan. These are people who will reliably bend over for the mining companies; the Mount Polley mine ought to telegraph to you the consequences. PolyMet wants to pour its toxic sulfide sludge into an already creaking and leaking tailing reservoir that it bought from LTV Steel — out of bankruptcy. And this is true, I swear it, although I wish it wasn’t: the same firm of engineers who designed the Mount Polley tailings basin are expert consultants to the DNR on the PolyMet tailings basin. You must release us from some of this onerous red tape that Mike McFadden and Dario Anselmo used to talk about all the time. If you don’t, the miners get it. Then the regulators, the IRRRB, and the legislators will line up — in a pubic ceremony full of pageantry — for their rogering. Well, not really; it’ll be done behind closed doors, as I am sure you are all well aware. How are you going to pay for the messes you make? How are you going to protect the government, the landowners, the resort businesses, the water, the fish, the wild rice? And why are you telling us that the only party with an 800 FICO score isn’t coming to the table? But financial assurances have been consigned to afterthought. If a Mount Polley happens in Minnesota, though, somebody or some bodies better get ridden out of town on a rail. Update: The video at this link is worth watching just to see the BC mining regulatory apparatchik squirm. The regulators in British Columbia are even bigger lickspittles that the Land and Minerals Division.